An unusual Hitchcock film in many ways, including that it has little hint of plot twists, The Birds amounts to Hitchcock's masterpiece entry in the late crop of 50's monster films. At least that's one way to look at it. Another is as a precursor, much as Psycho was to slasher-mania, to Stephen King-like nature gone mad menaces, and the gradual psychological deterioration, and eventual modest triumph, of a small set of humans who we get to know intimately. Tippi Hedren plays Melanie Daniels, daughter of a newspaper owner in San Francisco. She's a bit mysterious, and becomes more so as the film progresses (she's the primary exhibitor of the ever-present Hitchcock Hero Bewilderment here). All we really know about her at first is that she likes birds, because we meet her in a bird shop as she waits for a delivery of a Mina bird. When she runs into Mitch Brenner (Rod Taylor), she capitalizes on an opportunity to play what she thinks is a practical joke, posing as a bird shop employee. 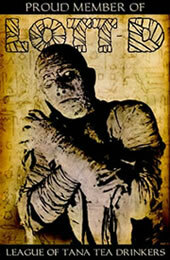 However, he knows who she is, and doesn't appreciate practical jokes. Thus starts the beginning of one of the oddest and most intriguing relationships committed to celluloid, as Melanie and Mitch court a bizarre combination of loathing, attraction and fascination with one another. The emotions lead to Melanie following Mitch to Bodega Bay, a sleepy little seaside town 60 miles north of San Francisco, to deliver lovebirds to him in a manner that would make Rube Goldberg proud. But shortly after the delivery, a seagull attacks Melanie--a chilling portent of things to come. The things that stand out the most in The Birds, aside from the usual crispness of direction under Hitchcock's hand, are the oddities. For one, there's an Eraserhead-like abundance of really, really long pauses and dearth of dialogue. There are countless scenes in which characters will just look at each other for a long time, even despite strong emotional reactions that would usually cause other characters to ask what was wrong with them. It's as if Hitch was flirting with making a film completely free of dialogue, but thought that might be just too weird to have any commercial success. In any event, there's a bucketful of successful experimentation with communicating more through silence than through words. The other thing that will immediately strike Hitchcock--and especially Bernard Herrmann--fans is the absence of any kind of normal score. I strongly disagree with those who claim that there is no score, period. Rather, just like Hitch was experimenting with absences of dialogue, The Birds employs experimental music--namely, musique concrete, which is perhaps best known via Stockhausen and John Cage. Here, Remi Gassmann and Oskar Sala have composed a musique concrete piece that consists primarily of manipulated bird sounds, which provides an unearthly, surrealistic backdrop to the frightening bird attack scenes. There are hints, and I don't think that I'm just pushing my interpretive critic's license beyond a reasonable limit, that Melanie is somehow correlated to the attacks. There are comments made by characters that the attacks began when she arrived with the lovebirds, which is true, and that she might be evil. Combined with her propensity for lying and her firm embrace of the Hitchcock Hero Bewilderment look with a sly underbelly, you could even interpret her as some kind of demon or the devil in human form, come to bring disaster on a small community. Wisely, Hitchcock leaves the issue unanswered, and the `first ending' (one Hitchcock characteristic is that he often employs many) is a strong candidate for a direct influence on George Romero's Night of the Living Dead, which also leaves many questions unanswered. 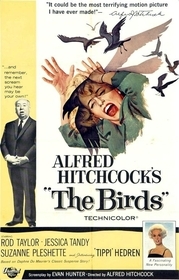 On the other hand, Hitchcock's inspiration for the film was an actual news item about a bird attack that occurred for unknown reasons, and we could guess that the grand intention was to make the incidents remain innocent and mysterious from a human perspective. The centerpiece here, of course, is the bird attacks, which still have the power to scare the pants off of many viewers. 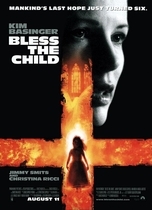 If nothing else, you have to admire the ingenious direction that features shots such as school children running down an endless country road in terror and a character's bad decision to seek shelter in a phone booth. Ray Berwick was responsible for training hundreds of birds, gulls, crows, etc. to act like they were attacking without actually hurting anyone. While these scenes are incredibly effective, in my opinion, it is interesting to note, as an aside, that you can certainly `see through' the composite effects if you analyze particular shots. Likewise, you can 'see through' effects backdrops, such as when Melanie is driving or boating. I bring this up to emphasize the fallacy of criticizing modern cgi effects for being 'fake looking.' All effects shots are fake looking, really, but ultimately, we're consuming theater, and we have to bring our imaginations along, as well, as we do in The Birds. Hedren actually received a cut on her face by a bird in one of the shots. Hitchcock makes his usual cameo at the beginning of the film. He's seen walking two dogs out of a pet shop. An intended final shot of the Golden Gate bridge covered in birds was never shot, due to budget considerations.